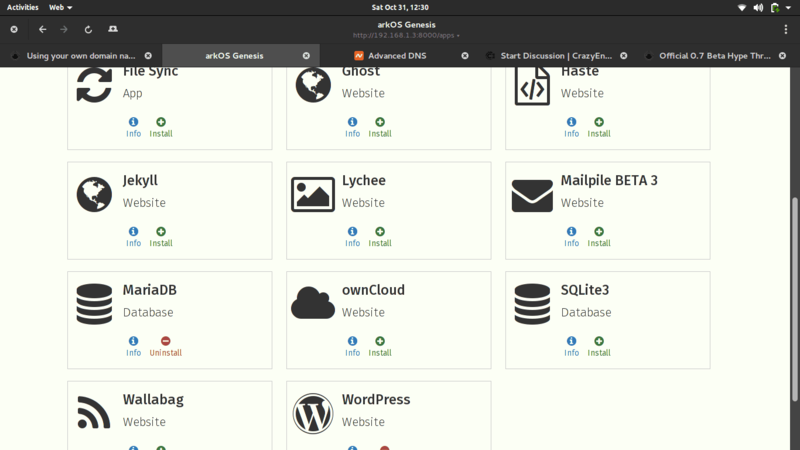 How To Setup Blog/OwnCloud/ChatServer/MailClient At Extremely Cheap Cost. 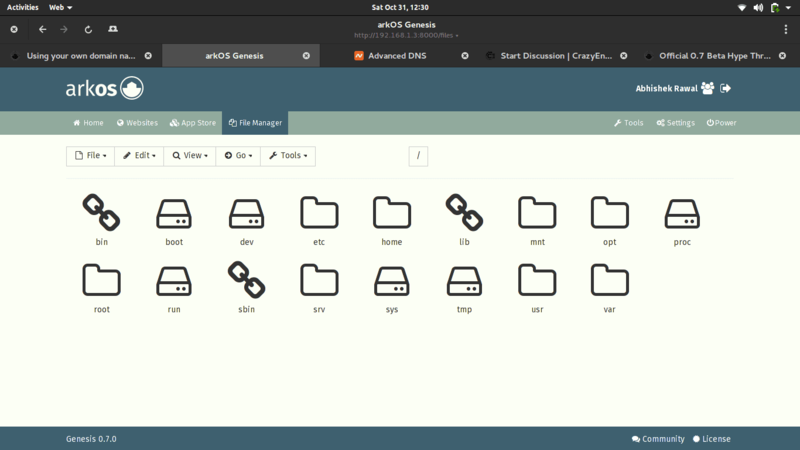 - Sdcard to install ArkOS in it. 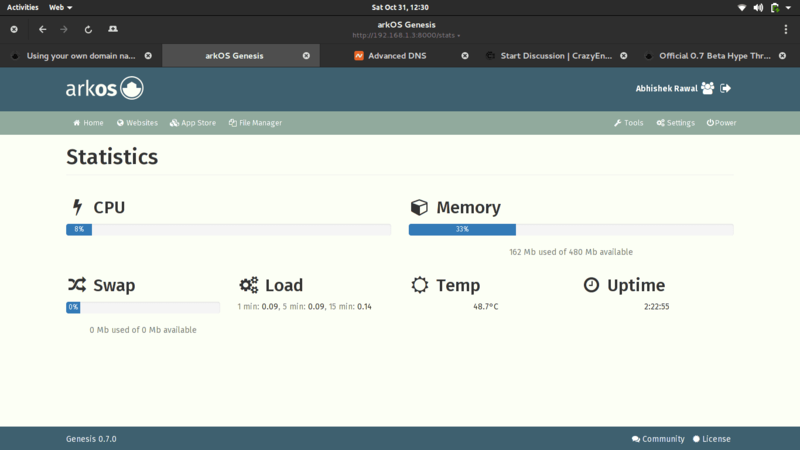 1) Download ArkOS from this page in your machine. 2) Unzip and/or tar xvzf the .zip and .tar.gz file, respectively. 4) After OS is installed in sdcard, insert it in your development board and boot it. In your case it could be 192.168.1.7, 192.168.1.6 or whatever (192.168.x.x). After typing that in browser, It should open the Genesis/Kraken GUI and it will ask you to setup the username and password, which is pretty easy like filling the form. 10) Now purchase a domain name from whichever service provider you prefer. I recommend namecheap though. 11) Once domain name is registered, open Genesis GUI and install Wordpress. Time it will take to complete the task depends upon the development board speed and internet speed. 12) Once WP is installed, it will notify you that Wordpress has been successfully installed. Now go to Genesis GUI -> Websites -> Add Websites and hit on your Wordpress website. 13) Server requires static IP and most ISP doesn't provide static IP for free. What really happens that the IP changes every short period of time, making server inaccessable. To avoid this, we will use Free DDNS service provided by cheapname and using ''ddclient' we will refresh dynamic IP and send it to cheapname database and we will be able to host website from home server. 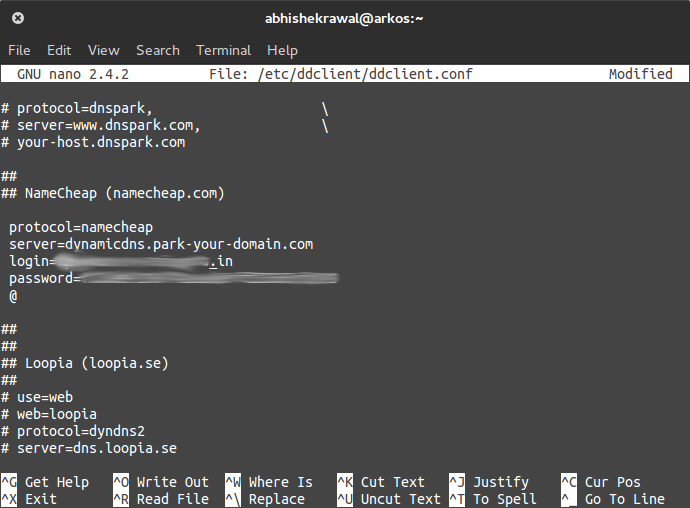 14) Go to cheapname.com -> Domains -> FreeDNS. Write your domain you purchased before and hit on 'Get DNS' and click on checkout, this will cost you free. Once done, fill in the details, it asks for and later in panel, go to 'Advanced DNS', under 'Dynamic DNS' flip the switch from 'off' to 'on' and the md5 hash will be generated, save it some safe place as it will be used later in next phase. Press Ctrl+X and save it. 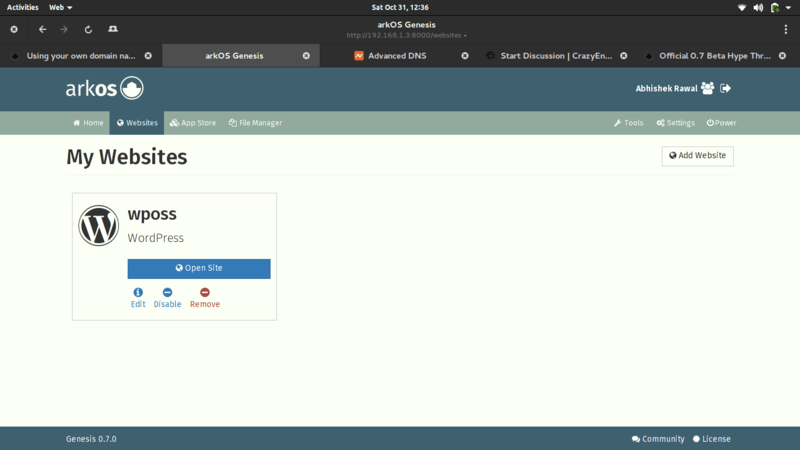 21) Now open Genesis GUI and -> Settings -> Networking -> Hosts, and setup host with your domain. 22) Do port-forwarding in your router for your IP of Raspberry Pi. 23) Lastly, open namecheap.com and under host records, add the host for your IP and you're done. Your blog is live on internet. Note : Pardon me if it looks so messy, I wrote this in mere 10 minutes as I am getting late for work. I will refine the post later on.